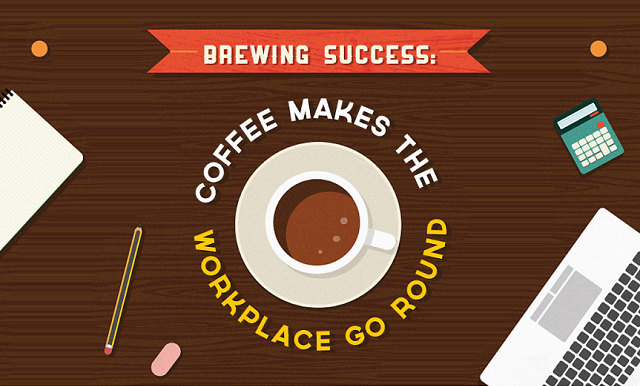 Brewing Success: Coffee Makes the Workplace Go Round #Infographic ~ Visualistan '+g+"
Over half of the workers in a typical office have a coffee break during the day. But decision makers don’t mind. In fact, 9 out of 10 think a coffee break or two with co-workers increases productivity and improves morale. You’ll find many other interesting coffee tidbits in the infographic below. For instance, caffeinated workers have an improved performance and made fewer errors compared to their decaffeinated co-workers. And, for people who sit at their desk and work on keyboards all day, caffeine has been shown to ease pain in the neck, shoulders, forearms and wrists. Studies have even found that coffee breaks bring people together which tends to promote the sharing of professional opinions and encourages creativity.